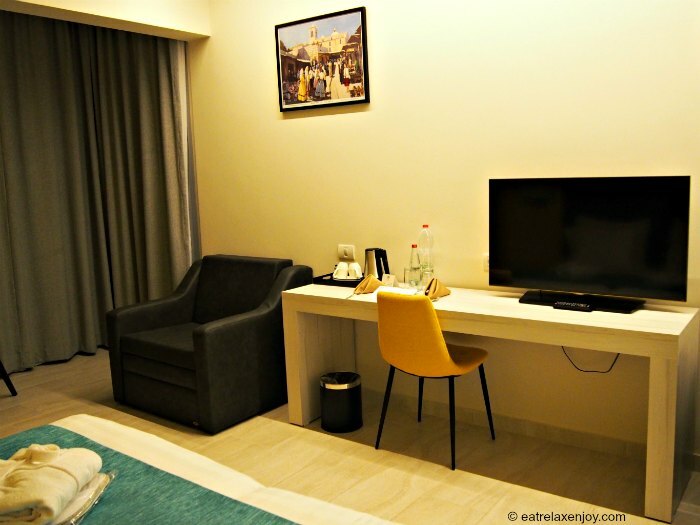 Legacy Hotel Nazareth is an excellent accommodation choice in Nazareth. It is central, relatively small and intimate, well designed, clean and inexpensive. 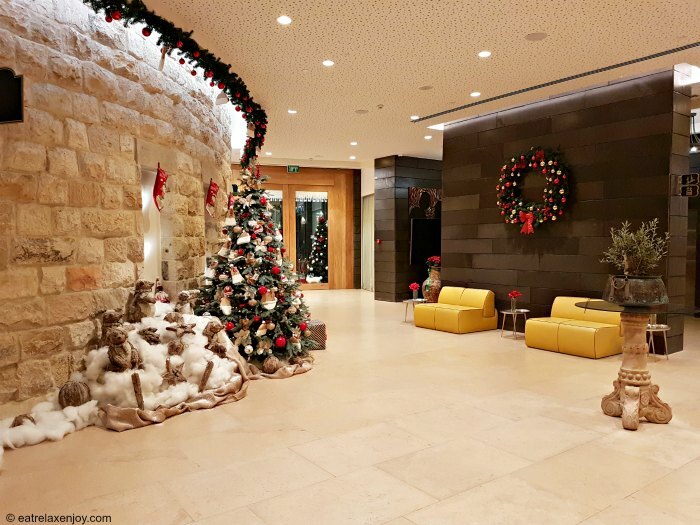 I spent a weekend early December at the Legacy Hotel Nazareth and enjoyed the hotel, its Chef Restaurant “Oud”, and the Christmas spirit. 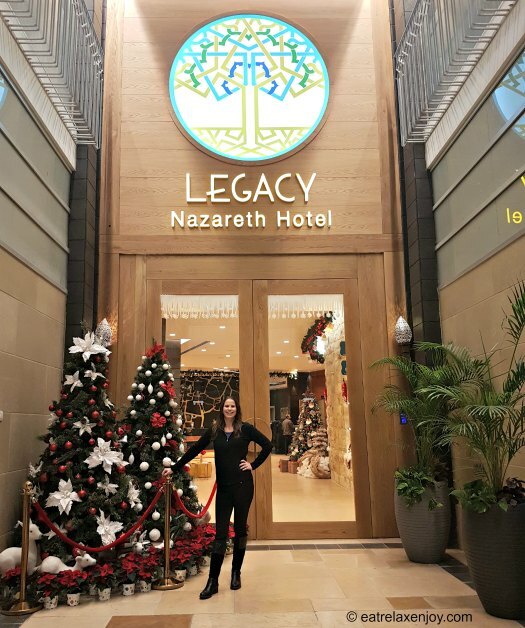 Legacy Hotel Nazareth is a brand new hotel that was recently built from the ground up. This makes it a very comfortable hotel as the building was designed for this purpose from the beginning. The hotel has around 100 rooms and suites, some accessible. 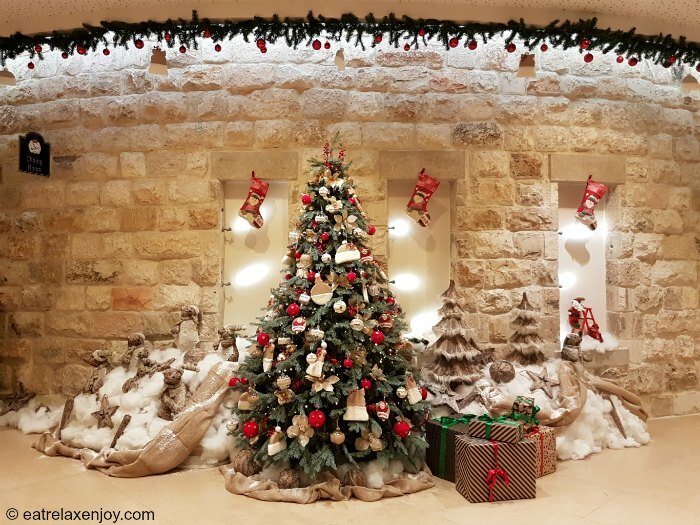 The décor brings Nazareth and the Nazareth Street into the hotel. This is expressed in the combination of Jerusalem brick stone in the walls and ancient elements such as the Flower of Life that repeats here on the carpets, on the chandeliers and as a design element around the hotel. The combination of colors is a mix of reserved colors with yellow and cyan, as a calm reflection of the sky. This combination generates an interesting contradiction of old vs. new, ancient vs. modern, west vs. east. 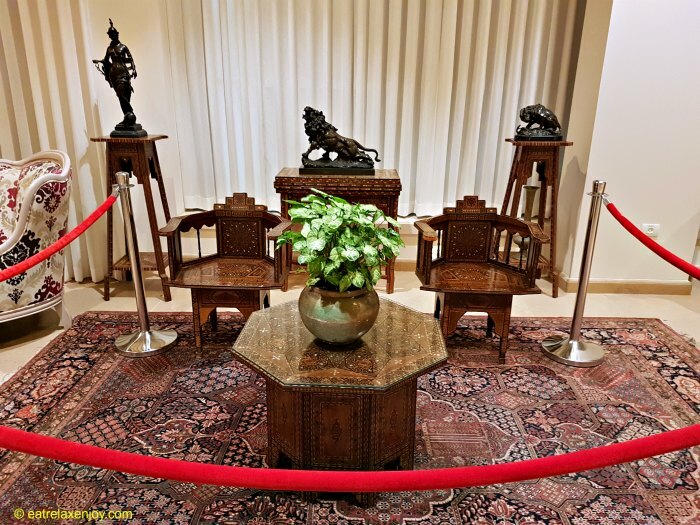 Some of the furniture in the lobby is family items of the Afifi family, the hotel owners. There is an area dedicated to old items that were part of the dowry of the Afifi family’s grandmother. The items are from Damascus and they are 100 years old. There is also a library full of books (in Hebrew) of Ahmad Afifi. In December, the hotel dresses up for Christmas with green, red and gold. Decorated Christmas trees are installed at the entrance. The holiday decoration is everywhere and even Santa Claus is here to give gifts to the guests to the sound of Jingle Bells. The following photograph was taken from the reception to the entrance. The rooms at the Legacy are spacious. They can accommodate up to 3 beds easily. 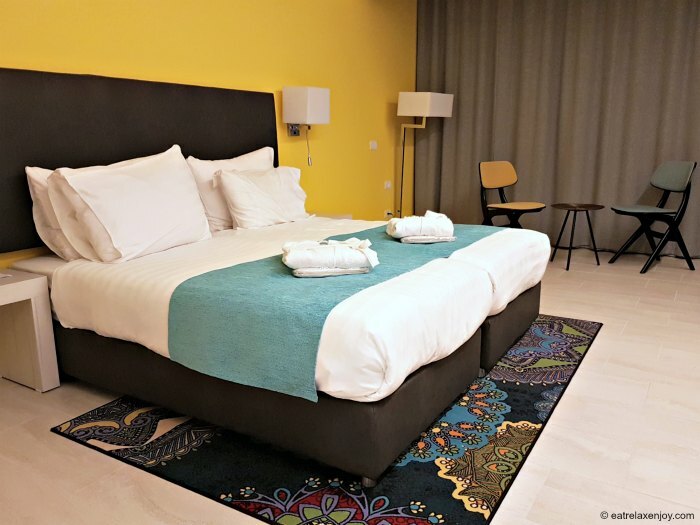 The room is modern and the décor has the colors of cyan and yellow. The beds are comfortable and the winter blankets are thick. There’s a flat-screen TV with plenty of power outlets for the cell phones. The climate control works perfect. There is also a sitting area inside and one on the balcony. Our room was facing the city giving a nice view but because it rained we hardly opened the curtains. 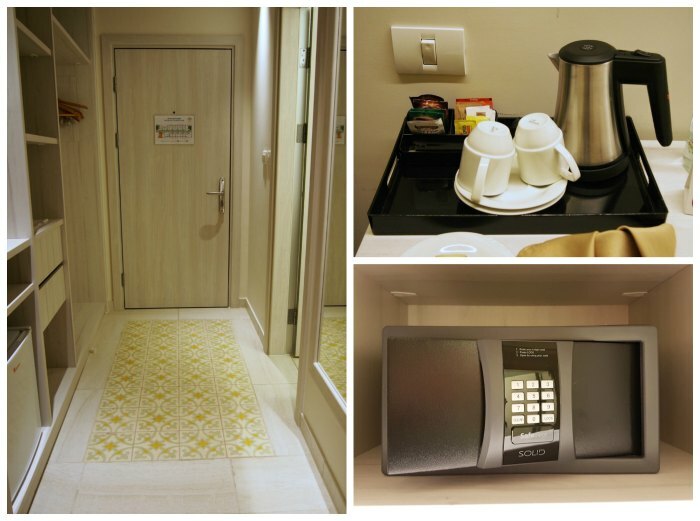 The room is equipped with whatever is needed – from a magnifying mirror in the bathroom, a safe large enough for my laptop, a blow dry and coffee making facilities. There’s also a huge wardrobe. Have a look at the tiles on the floor – this is the style of tiles common in old and ancient Arabic houses. The bathroom is small but convenient. 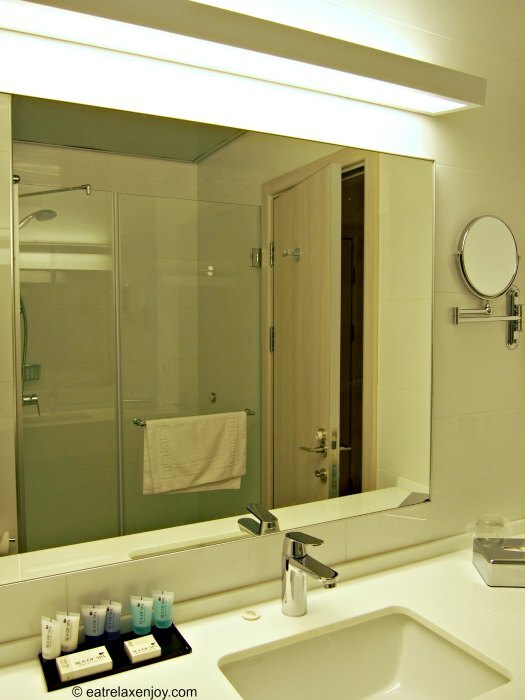 There is good water pressure and everything is clean and modern with plenty of space to put the toiletries. 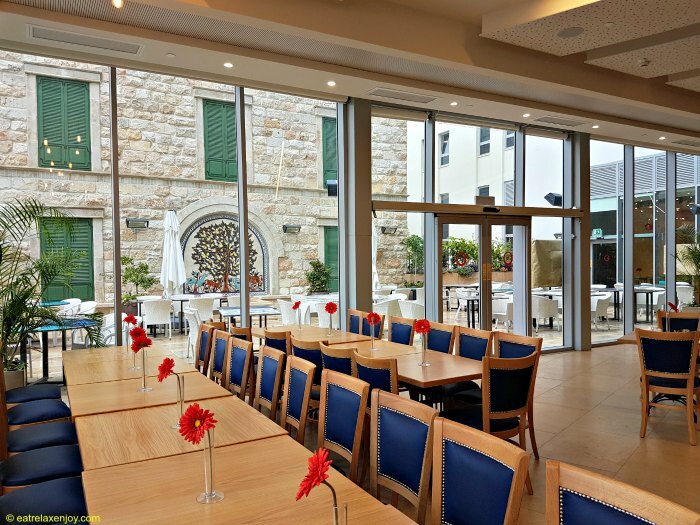 Breakfast and dinner are served at the spacious Souk Restaurant. 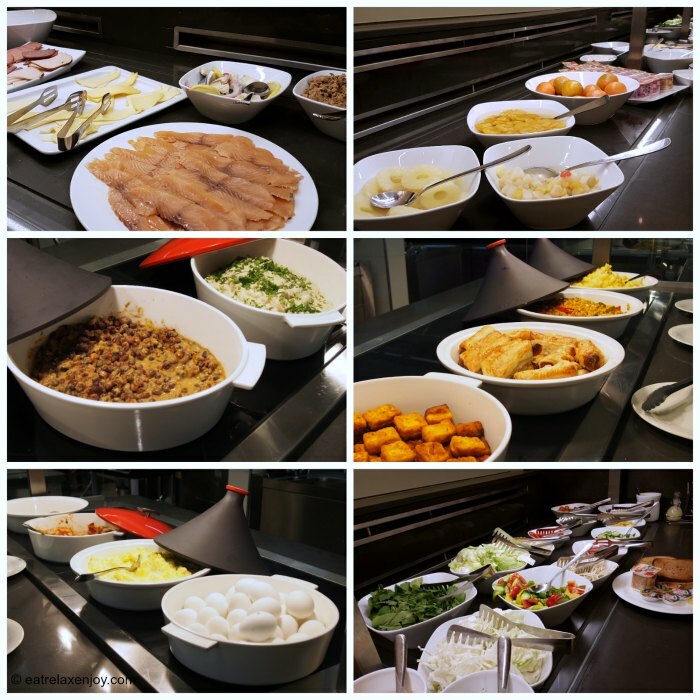 Breakfast is served buffet style as is common in Israel – plenty of bread, vegetables, cheeses, and cereal. There is also a good choice of fish. 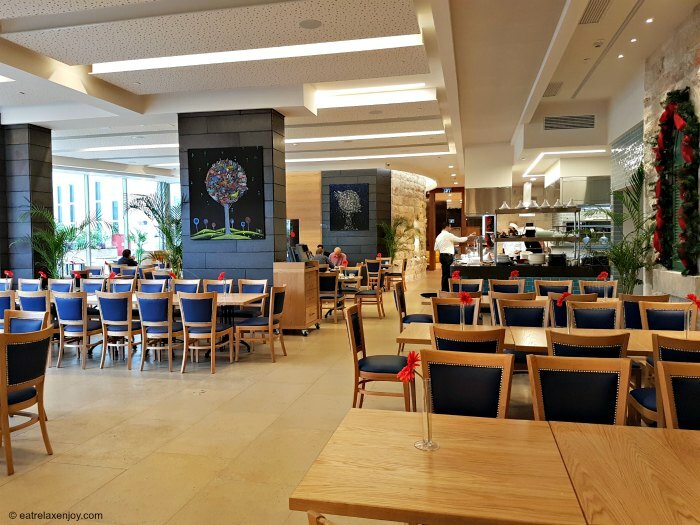 Since this is a Christian area, the hotel is not Kosher, which can be a big advantage, as they can serve warm breakfast also on Saturday (most hotels in Israel are kosher and won’t cook on Saturday). Another aspect is that they serve meat at breakfast as well (not common in Israel). So you can have a sausage and an egg made to order also on weekends here. Because it is Nazareth – you’ll also get here Msabbaha – warm Hummus – a real treat! plus other local delicacy such as fried cheese and Shakshouka. Breakfast also has dessert – good coffee and pastries with Halva. When the weather is nice, you can eat on the terrace. There is a lot of light in the restaurant and it feels like sitting outdoors. If you are interested in some fine dining, the hotel has a Chef Restaurant called “Oud” (a local musical instrument) and a bar. Oud is an A la Cart Arab fusion restaurant. The chef is Johny Gorik. 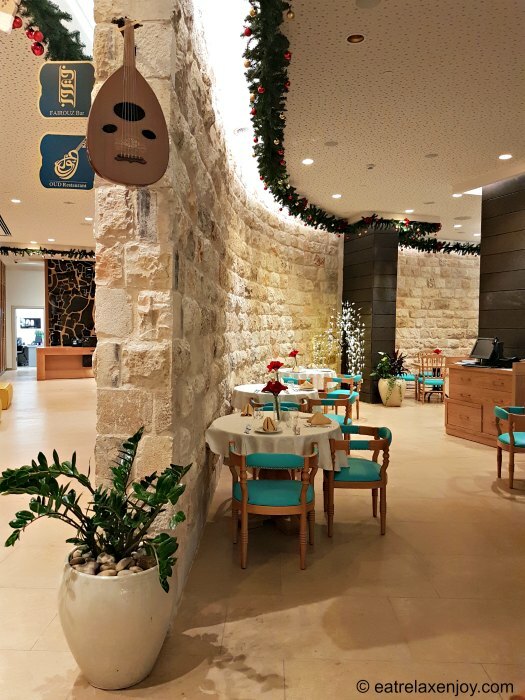 You can read more about the restaurant in Oud Restaurant Nazareth. 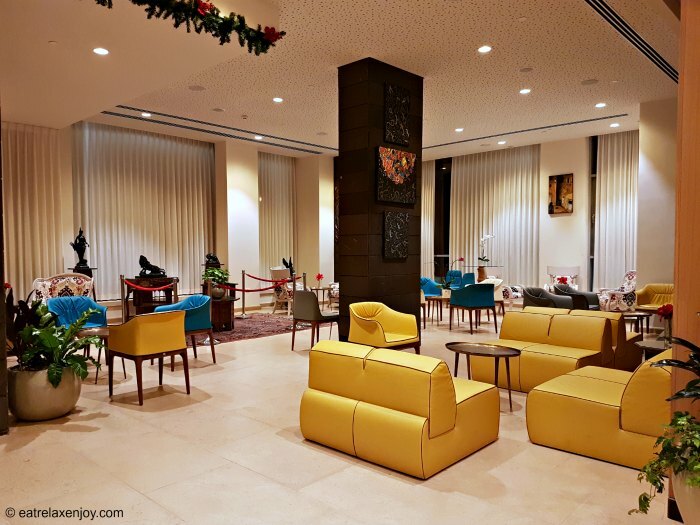 The hotel’s Fairouz bar serves warm and cold drinks as well as alcoholic beverages. 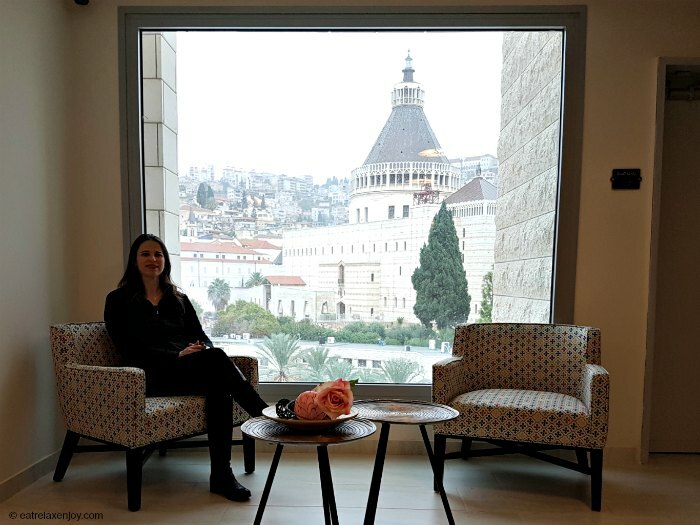 Legacy Hotel Nazareth is located a stone throw from the Basilica of Annunciation and the market, and is within a walking distance from the most popular Nazareth travel sites. The Basilica of Annunciation can be seen from the hotel windows (see below, a photograph taken near the hotel’s elevator). 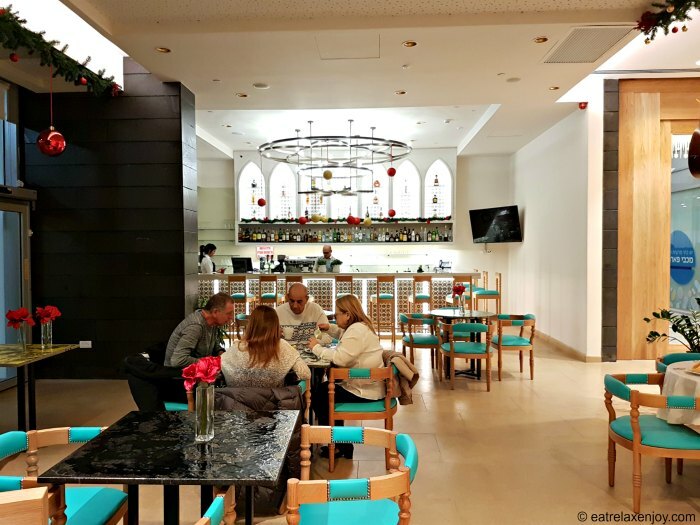 If you want to learn more about Nazareth, read the travel sites of Nazareth and Christmas shopping at Big Fashion Nazareth (a big shopping mall).